Middle Tennessee native and international country music ambassador, Chris Young, is looking forward to coming home on September 30 to headline Nashville’s most exciting new venue, Ascend Amphitheater. A special stop on the “I’m Comin’ Over” World Tour 2015, the hometown show takes place just days after he returns from a sold-out, two-week run of dates in Europe and the UK. 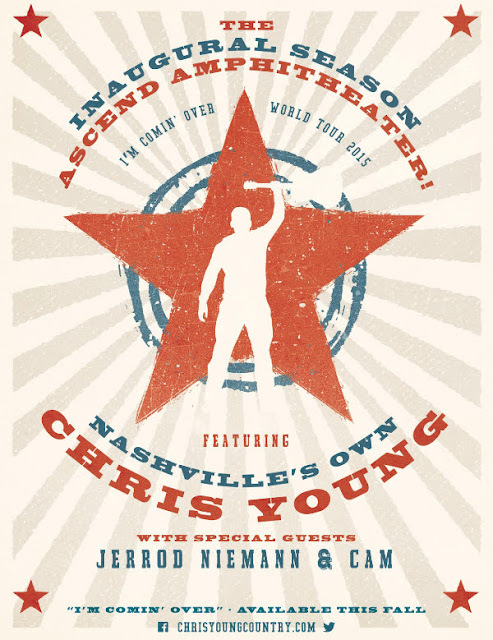 Joining Young at Ascend Amphitheater are Sony Music Nashville labelmates Jerrod Niemann and Cam. Tickets for Chris Young’s September 30th show at Ascend Amphitheater go on sale at 10am central this Friday, August 28th, and can be purchased at Ticketmaster and chrisyoungcountry.com. Closing in on five million views for his steamy new music video, “I’m Comin’ Over,” Chris Young, one of country music’s “strongest, most distinctive voices,” (Billboard) will release his fifth studio album this Fall after kicking off his “I’m Comin Over” Tour October 22 in Savannah, GA with openers Eric Paslay and Clare Dunn.